Iraqis Reach Tentative Deal On New Government : The Two-Way After an eight-month stalemate, officials in Iraq have a tentative agreement on a new government. The deal expected to be ratified by Parliament on Thursday looks a lot like the previous government, with a few exceptions. In Iraq, after an eight-month political stalemate, officials have reached a tentative deal on a new government. Parliament is expected to ratify the deal later Thursday. The new government is expected to look a lot like the previous one, with a few exceptions. 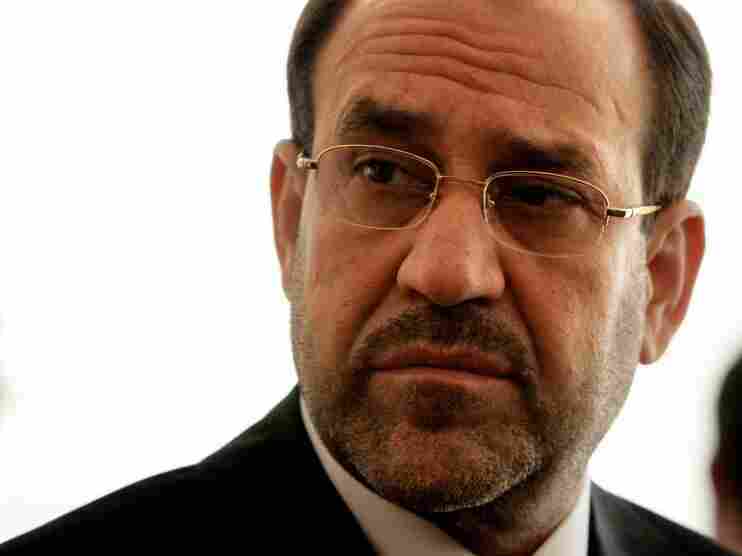 What's almost certain to happen is that Nouri al Maliki, a Shiite, will remain prime minister. And Jalal Talabani, a Kurd, will remain the president. The third top post in the country, the speaker of Parliament, will be given to a Sunni. What's not yet certain is who that Sunni will be. This is basically the way things were doled out before between the three main factions -- Shiites, Kurds and Sunnis. The difference this time is that the Sunni bloc, the Iraqiya party, the one that actually got the most votes in the March 7 election, has in a sense come in third place. That's because they could not find enough coalition partners to get a majority of seats. The head of the Iraqiya party, Ayad Allawi, had been vying for a top post. It appears now he won't get one. He and his American supporters were pushing for him to take the presidency. But the Kurds wouldn't budge on that. Allawi's case is an interesting one. He's a secular candidate who has the support of nearly all of the country's Sunnis. The Americans and Iraq's Sunni neighbors -- such as Turkey and Saudi Arabia -- had hoped he could take a top job, to maintain the balance of power between Sunnis and Shiites, and to keep the country from lurching back into sectarian unrest. Now, instead, his party is getting the parliament speaker post and also might head a newly created national strategic council. What's unclear is whether this committee will have any teeth -- whether it will be a real check on power. What Allawi himself will decide to do remains unclear. But many of his fellow party members have signed on to this deal. As for Maliki, he was able to gain support and form the winning coalition because of the backing of Muqtada al-Sadr, the anti-American Shiite cleric who at one time was Maliki's arch rival. It's been reported that Iran was instrumental in this alliance -- that the Shiite-dominated Islamic Republic preferred to see all the Shiite parties together in one coalition, rather than fighting each other. Now the questions are: What role will Sadr play in the new government? What ministries will his people get? Will his armed wing, the Mahdi Army, continue to hold the cease-fire they agreed to back in 2008? Will Mahdi Army splinter groups stand down? And, will they force Maliki to hold firm to a December 2011 deadline for American troops to depart Iraq? Defense Secretary Robert Gates this week said troops would stay on ... if they are asked. But with Sadr in the government, it's hard to imagine the government will make such a request. "The apparent agreement to form an inclusive government is a big step forward for Iraq. All along we've said the best result would be a government that reflects the results of the elections, includes all the major blocs representing Iraq's ethnic and sectarian groups, and that does not exclude or marginalize anyone. That's exactly what Iraqis seem to have agreed to. "Just as important, Iraq's leaders negotiated and apparently agreed to a major redistribution of powers that creates real checks and balances against the abuse of power by any one group. This looks like a good outcome for those working for a stable, peaceful Iraq and a bad result for those whose agenda is more sectarianism and violence." -- BBC News: "Iraq Parties In Government 'Deal' "
-- Al Jazerra: "Iraq Reaches Power-Sharing Accord"
-- The New York Times: "Tentative Deal In Iraq Keeps Maliki In Power"